Studies have shown that skipping breakfast leads to being overweight, which is why these quick and healthy breakfast recipes for weight management are so helpful. Most experts agree that eating a nutritious breakfast that is high in fiber and protein not only revs your metabolism, but gives you enough energy to get through the day. The healthy breakfast recipes listed below are low in calories and high in nutrition. Some of these recipes you can make the night before and pop them in the microwave in the morning — or you can quickly assemble them in the morning. This healthy breakfast recipe, courtesy of Francesa Pucher of Fitness 121, is a nutritious start to your morning. Mix fruit together and put half of the mixture into a large bowl. Blend yogurt with cinnamon and honey. Spoon half of the yogurt mixture on top of the fruit. Then top with half the cereal, coconut and nuts. 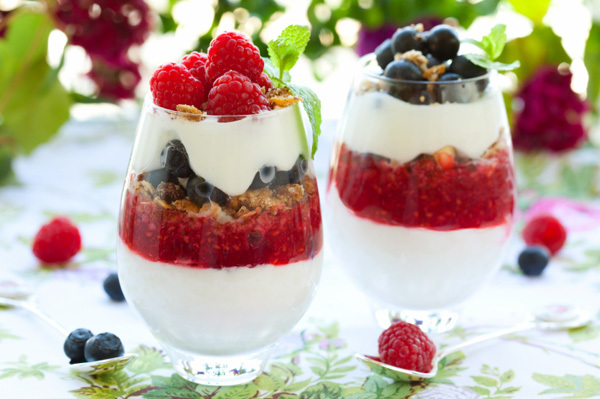 Repeat the layers with the remaining fruit, yogurt, cereal, coconut and nuts. In a medium pan, heat the oats, apple, water and salt over medium heat. Once the mixture begins to simmer, approximately five-to-six minutes, turn it down to medium-low and cook for another three-to-four more minutes to allow the apples to soften. Stir often. Next, add the vanilla, flaxseed meal, stevia and cinnamon and stir until incorporated. Pour into a serving bowl and top with Uncle Sam cereal and toasted walnuts. Enjoy! Recipe courtesy of Sheila Viers of Live Well 360. Brown ground meat, with seasonings, in a skillet that has been sprayed with non-stick cooking spray. In a medium bowl, using a wire whisk, beat eggs with sour cream and yogurt (or milk) until smooth. Mix in onion and ground meat. Spray a nine-inch pie pan with nonstick cooking spray. Pour egg mixture into pan. Bake for 35 minutes or until a knife inserted in the center comes out clean. Top with cheese and return to oven for two minutes or until cheese is melted. Source: Quick and Healthy recipes , © 2009 Brenda J. Ponichtera, R.D., Published by Small Steps Press, publishing health conscious books for the general population, a division of the American Diabetes Association; retail $18.95;To order call 1-800-232-6733 or visit www.QuickandHealthy.net. Also available at local and online bookstores. In a small bowl, pour boiling water over the All Bran cereal and let stand until softened. In a large bowl, mix egg substitute, buttermilk, sugar and applesauce. Add the All Bran/water mixture to the egg mixture. Stir in flours, baking soda and salt (optional). Mix just until moistened. Stir in Bran Buds or 100% Bran cereal. Pour into an eight-inch square pan that has been sprayed with nonstick cooking spray. Bake for 55–60 minutes or until a toothpick inserted into the center comes out clean. Note: One serving is an excellent source of fiber. Source: Quick and Healthy recipes © 2009 Brenda J. Ponichtera, R.D., Published by Small Steps Press, publishing health conscious books for the general population, a division of the American Diabetes Association; retail $18.95;To order call 1-800-232-6733 or visit www.QuickandHealthy.net. Also available at local and online bookstores.